Day four at the 2014 Melbourne Grand Prix, race day! My first ever live F1 race and I was very much looking forward to it. Weather was dryer than the previous day, but not as warm and sunny as the first two days. It was a dry race in the end though. Our race day stand was at the rather less posh end of the circuit, but still a good view none-the-less. Not so great for photographs as the top of the stand was not above the fence, but to see the race cars actually racing click here. 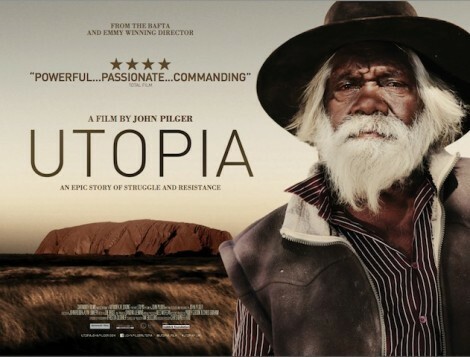 Utopia is the latest film by John Pilger, a journalist who has been making films describing the treatment of Australia's indigenous population for some time. It was on free-to-air TV here in Australia last week and has previously been shown on TV in the UK. It certainly lacks subtlety and doesn't champion many positive stories, but it is valuable none-the-less because it is an appalling situation and one which most Australians pretend does not exist or is the fault of the people concerned. There has been quite a bit of animosity against the film for those very reasons and it is interesting to read Adam Goodes' response to that here. Adam Goodes is the current Australian of the year and an successful indigenous footballer. If you are in Australia it can still be watched online at SBS on demand here , or you can watch it here from anywhere in the world. Finally, you can visit John Pilger's site about the film here. Where were you this morning? We joined the Adelaide part of 'March in May', protesting against the way the government is running things and against the budget cuts to those that can least afford it in particular. The plan is to run these marches every two months, lets hope they get bigger each time until the government gets the message that people don't accept their cuts. A couple of my favourite placards were: "Due to budget cuts the light at the end of the tunnel has been switched off" and "We have a budgie problem", the latter accompanying a picture of Abbott in his budgie smugglers. If you didn't go along today, maybe go along in August? The organisers have a March in Australia page with details and links here. Day three at the Melbourne Grand Prix. It is qualifying today and all the pre-season activity finally gets to mean something real. We probably had the best view of the weekend on this day, overlooking the first two corners from the opposite side to day one. I got more shots of the cars in action on this day and the rain during quali certainly added to the interest. So, to see the drivers actually trying as hard as they can, click here. Unfortunately, casual racism against Australia's indigienous people is still fairly rife and seems to be accepted in a way that it would not be for any other group. This week is National Reconciliation Week, which uses the anniversary of our indigenous people being brought under common law with the rest of the Australian population, to highlight the ongoing need for non-indigenous Australians to respect Aboriginal people and culture. The week celebrates the referendum in 1967 which removed the federal right to make separate laws for Aboriginal people. It never fails to amaze me that whilst the world was protesting against apartheid in South Africa in the 1960's, in several Australian states Aboriginal people did not have the right to vote. Learn about Reconciliation week here. So, not particularly surprisingly the Abbott government is intending to bring the budget back to surplus by cuts to Government spending, rather than fixing the degraded tax system we have thanks to Peter Costello's tax cuts during the Howard era. That's one way of doing it I guess, but the question is what are they going to cut? The answer is of course that they are going to impose cuts on idealogical grounds that mean the lower income families in Australia bear most of the burden once again. But, will this help our economy? As it happens there is no evidence from economics around the world that it will, in fact austerity budgets usually result in economies performing less well. So when you hear the government saying we have to fix our budget (we have one of the lowest debt levels in the developed world), to fix our broken economy (one of the best performing in the developed world), ask yourself whether the two things are actually connected and read this article.